Are you looking for an educational preschool that focuses on your child’s learning and development to prepare them for school? We use a hands-on approach to learning in a multi-sensory environment. Our staff focuses on how your child learns to maximize their learning in a safe and loving environment. Contact us today for a tour to get your child’s education off on the right start! Register today! Our preschool programs are designed for children 3-5 years of age. The preschool programs will run from 9:00am-12:30pm. The program will be based on various themes throughout the year. Snacks are included daily. The Preschool Program is based on student directed and teacher directed methods. Students will have the opportunity to explore through centers and whole group activities using a multi-sensory approach. Kid’s World will have student and teacher directed small groups. The students will learn beginning reading and math skills along with social/emotional objectives. Science and social studies objectives will be presented throughout the year. 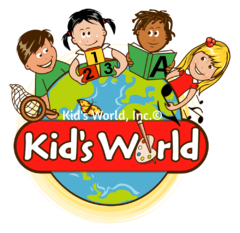 Kid’s World uses a variety of proven programs in our preschool. Come in and see for yourself! Activities are weather, calendar, story time, show and tell, games, songs, musical instruments, finger plays, conversations, and other activities for the group to enjoy together. Children will have an opportunity to choose a variety of activities every day, including manipulative items, dramatic play, blocks, reading corner, science corner and cooperative play. This time is also for the creative activity of the day, connected with the day’s lesson plan. Teachers will have an opportunity to focus on a particular skill with a small group of children together. Students will have the opportunity to share their learning with the teacher. Children will have the opportunity to create with a variety of materials. Arts and crafts will work on fine motor and hand-eye coordination skills. Children will have the opportunity to listen to a variety of stories geared around the various themes. Stories will develop listening skills, comprehensions skills and develop a sense of joy for reading. Children are encouraged to socialize with their peers and develop their creativity through outdoor play. We will provide equipment which includes swings, interlocking blocks, panels and posts to build, a pebble box, various balls and an art studio. If the weather doesn’t permit, children will be able to play indoors. We will not go out for a lengthy time if it is raining, snowing or too cold. The staff will decide to limit outdoor play due to weather or safety concerns. Children can go to the restroom any time during the day. Teachers take all children to the restroom before snack, to make sure all hands are washed. Snack time gives children an opportunity to talk together as a small group, have prayer, practice manners, share and participate in cleaning up. Nutritious snacks will be provided each day. There will be opportunities for the children to complete cooking recipes during some classes. Site design by Websmiths, LLC. © 2016 Kids World, Inc.